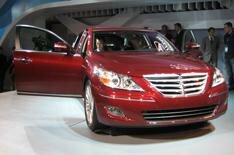 Hyundai Genesis | What Car? Well, after introducing the Hyundai Genesis, one company official described it as having 'the performance of a 5 Series and interior of a 7 Series - all at the price of a 3 Series'. That's brave talk, but the company is adamant that it has produced a car that offers high performance and bags of space. Armed with rear-wheel-drive, bags of accessories and a choice of 268bhp 3.3-litre, 290bhp 3.8-litre and 368bhp 4.6-litre petrol engines, and a price tag starting from $30,000 (about 16,000), it's easy to see why the Genesis arrives in America with such high expectations. Hyundai is sanguine enough to realise that none of that is going to be enough to crack the British market, however, and has no plans to sell the car here. Instead, we'll have to wait to see if the Genesis coupe, on show in Detroit as a concept car, follows in the range, because that is far more likely to appeal to UK buyers.